At the release of a FICCI – Technopak report ‘Indian Food Services Industry: Engine for Economic Growth & Employment – A Roadmap for Unlocking Growth’ at ‘Foodzania’, the food service retail conclave organized by FICCI in New Delhi, industry veterans urged government to accord industry status to food services sector. The Indian food industry is poised for huge growth, increasing its contribution to world food trade every year. In India, the food sector has emerged as a high-growth and high-profit sector due to its immense potential for value addition, particularly within the food processing industry. 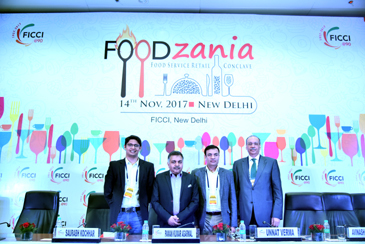 The Food Services sector is expected to have generated direct employment for 5.5-6 million people in the financial year 2016, which is expected to increase to 8.5-9 million by the year financial year 2021. Indirect employment has seen a growth at CAGR of four per cent from 2013-2016 and expected to grow six per cent till 2021. Food Services emerge as a key segment in Indian economy. Food Services market in India (organized and unorganized) is estimated at INR 3,37,500 crore in 2017 and is projected to grow at a CAGR of 10% over the next 5 years to reach INR 5,52,000 crore by 2022. Two mega metros, Mumbai and Delhi NCR contribute to 22% of the overall Food Services market (11% each) followed by six mini metros (Pune, Ahmedabad, Bengaluru, Chennai, Hyderabad and Kolkata) comprising of 20% share in the Food Services market. High percentage of young and working population which is well travelled have double incomes and is experimental along with being tech savvy, is eating out more than their predecessors, driving the growth of the Food Services market. Availability of organized retail space is helping in consistent growth of Indian and International brands across different formats. The impact of the market as a whole on the entire ecosystem – right from real estate to agriculture, kitchen equipment to supply chain and employment is significant. However, certain challenges such as availability of quality manpower, high attrition rate, high real estate cost, fragmented supply chain, over-licensing etc. act as headwind for growth of the industry. High percentage of young and working population which is well travelled have double incomes and is experimental along with being tech savvy, is eating out more than their predecessors, driving the growth of the Food Services market. Availability of organized retail space is helping in consistent growth of Indian and International brands across different formats. The Indian Food Services market space is attracting significant interest from domestic as well as international private equity and venture capital funds. The large number of investments can be attributed to the fact that the Food Services market is a domestic consumption driven story with great growth potential. Some key trends are gaining traction in the Food Services space like Virtual Kitchens and Ready to Cook players. Ordering-in has become an integral part of the eating experience and several logistics players are providing last mile delivery for restaurants. Thus, Food Services is emerging as a key contributor for the Indian economy, including employment generation, skill development, growth in the allied industries, entrepreneurship, and tourism and creating experiences for the Indian consumer. Underlining the importance of the Food Services sector Dr. Sanjaya Baru, Secretary General, FICCI said, “India’s overall retail opportunity is substantial, and coupled with a demographic dividend (young population, rising standards of living and upwardly mobile middle class) and rising internet penetration; strong growth in retail & e-Commerce is expected. The Indian government’s ambitious Make in India, Digital India, and Start up India project is indeed giving a great stimulus to the Food Services retail sector”. It is imperative for the Government and regulators to recognize the contribution and role of Food Services Industry and take measures to create positive policy framework for industry’s growth. Saloni Nangia, President, Technopak Advisors said, “Hopefully, various state and central governments will provide the requisite policy and fiscal support to enable it (the Food Services sector) to grow steadily and thereby make an even bigger positive impact by way of creating more employment and by way of meeting the changing consumer needs more efficiently”. Food Services sector has still not got an industry status from the government which further makes it difficult to attract the desired levels of investments. For the rapid growth of the sector, government should grant industry recognition to the Food Services sector and facilitate easy availability of working capital loan to the players through policy formulation. Food Services industry in India, the industry feels that policy formulation by government should have more active involvement of industry bodies (for example NRAI, National Restaurant Association of India). By actively involving stakeholders in policy making, transparency in decision making can be achieved and a realistic and effective policy can be formulated. Efforts have to be made to remove various factors that are impediments to the growth of the industry and impacting the smooth functioning of business operations.